This is not the fairytale you remember. But it's one you won't forget." I heard about this recently and was instantly excited by the idea of it. All girls grow up hearing the fairy tales of Cinderella, Snow White, etc. We all know the stories so well, so finding out that the story is being retold but with a futuristic twist is beyond exciting!! I wasn't sure when I was going to get the opportunity to read this, but looked through the UK Book Tours blog and found they were touring a copy - OMG I had to get on board with that and literally JUST finished reading it!! The UK cover is still undecided I believe, but this cover seems to be the only one on show. I really do hope it is picked as the UK cover as it pretty much is perfect. It tells you exactly what you need to know about the book and is a great opener to the story. I must admit when I started to read this, although I was really excited by it, I wasn't that keen. It just felt too strange having the mix of fairytale and sci-fi. But I was determined to carry on and I'm so glad I did, as I enjoyed it more and more. I was a little concerned at the beginning of the story that this would go exactly on the same lines as the original fairytale, meaning that there would be no surprises. Once again I am thrilled to say my concerns were unwarranted. 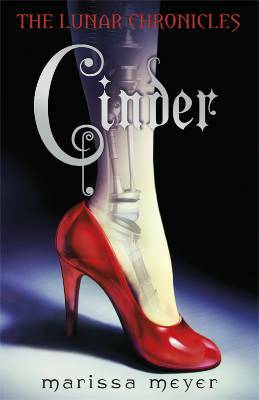 You don't lose any of the wonderfulness of 'Cinderella' but just get a whole load of new and fantastic parts that actually fit in with the original premise. For me it just made this tale completely fresh. You are left with somewhat of a cliffhanger, again this is really exciting. I'm so eager to read what is going to develop, but also how the tales of Red Riding Hood, Snow White & Rapunzel are going to be woven in. Everyone seems to really enjoy this book I have to get to it soon I wasn't sure of it at first but there must be something good in there :) Excellent review!